Hi there! We have a brief break in between authors, so I popped in to say hi! An old romantic suspense of mine got a new cover. HIGH TIDE is set in Hawaii and deals with a heroine who is afraid of the ocean. She probably picked the wrong place to live, right?!? Do you have any phobias about the ocean, or swimming in general? I love to swim, but I will not go underwater in the ocean. The salt gets in my eyes and I end up walking blindly with my arms stretched out back to my towel on the beach. Needless to say this makes for some awkward confrontations. :) Honestly, I did this as a kid and ended up in the property of the Clearwater Beach security as they waited for my mother to come find me. Yep, not a big fan of saltwater in my eyes! How about you? When did you learn to swim? Do you avoid the water at all costs, or are you a dolphin? 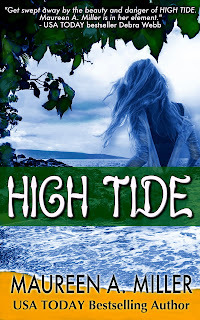 HIGH TIDE is #FREE on Kindle Unlimited if you're looking for a little romantic suspense getaway! U.S. Geological Survey expert, Nick McCord, cannot account for the strange phenomenons plaguing the Windward coast of Oahu. Breaking waves on a windless shore. Dead fish washing up on the sand. The only viable culprit for these anomalies is the new housing development, Manale Palms, and its attractive contractor, Briana Holt. Try as he might to find blame with Briana and her site, the truth remains a mystery. Briana Holt portrays herself to the outside world as a woman in charge. In reality she is burdened with insecurities, and one of those insecurities is over six-feet tall. Intent on defending her property from Nick's suspicions, she starts to dig deep into the peculiar episodes along the coast. Nick and Briana's mutual curiosity makes them allies, and their mutual attraction makes them lovers. Now, as they narrow in on the source of the mystery, they find themselves in a struggle to protect the coast...and their lives. I think I was about 6 when my mom took me to get lessons for swimming... loved it until they made you jump off a platform into the pool to pass the program... still remember how scary it was... still not great with heights. Yeah, the whole diving portion of swimming lessons was extremely scary. Especially the pressure of having to do it in front of other kids. Although I grew up near a beach, I never learned to swim. Loved bike riding down to the beach and watching the waves. I like water but not a great swimmer. But live to go to watermarks and float in the lazy river.